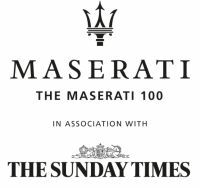 The ‘Maserati 100’ nominations page  will open at 07:00 Friday 1st February. Once again Maserati is inviting the nation to submit entrepreneurs they believe should be considered for the prestigious list, and who are exemplar innovators – someone who has had a big idea and converted it into a successful business. To nominate and for further information visit the nominations page . Nominations open on Friday 1st February and close at midnight on Monday 18th February. All entries will be adjudicated by The Sunday Times’ panel of experts and included if successful.